Qarash, the greatest city of the Khaganate, has been destroyed by treachery. Temur, a grandson of the Great Khagan, survives and goes into exile, knowing his cousin will seek his head to eliminate any rivals. At the same time, in distant Tsarepheth, the Once-Princess Samarkar is set to undergo her testing. She will casting aside her life as a noble to become a wizard, if she has the strength of character needed. The destinies of Temur and Samarkar are linked along with those of others: a half-blind warrior monk, a pregnant princess doomed by politics and a tiger-woman with formidable skills in battle. The destruction of Qarash and the raising of armies of ghosts portends the arising of a great threat which must be faced. 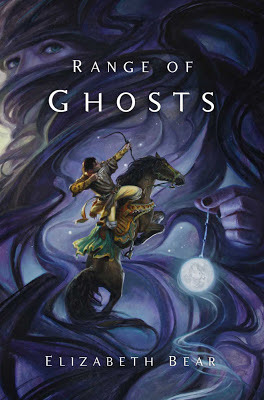 Range of Ghosts is the opening novel of the Eternal Sky Trilogy. This is a work that blends together different fantasy elements, with traditional epic fantasy stylings such as political intrigue and war mixing with both the historical fantasy of Guy Gavriel Kay and moments of offbeat strangeness that recalls the New Weird (though this is the least of the three influences). The world the book takes place in is reminiscent of our own Central Asia during the Middle Ages, with lands in the book serving as analogues of the Mongol Empire, India, China and Russia. These aren't quite one-for-one correlations, with Bear mixing things up in interesting ways. The skies over each land are different, with the Khaganate skies being filled with small moons which appear or disappear to herald the births and deaths of important figures. The Uthman Caliphate's skies have a sun which rises in the wrong location. These differences extend to constellations as well. It's an odd detail but one that is never dwelt on by the characters, as it's simply the way the world is to them. The book is divided amongst relatively few POV characters: Temur and Samarkar (whose names are echoes of Timur the Lane/Tamerlane and his capital city of Samarkand) are our primary protagonists, but we also get occasional chapters from Al-Sephehr (our antagonist) and Edene, an innocent woman caught up in events due to a chance meeting with Temur. The restricted POV count keeps the book moving quickly, but Bear is able to lace a lot of characterisation through this small POV count. Other fantasies, even otherwise excellent ones such as A Song of Ice and Fire, have a tendency to portray their 'barbarian' cultures fairly broadly (the Dothraki are rather under-developed and unconvincing compared to their Mongol, Hun and Amerindian inspirations, for example). Bear here flushes out the Qersnyk tribes with much greater nuance, noting their ability to speak many languages, their relaxed approach to religion and their military skills. Temur is widely-travelled and much more than the simple barbarian it would have been easy to portray him as. Bear also uses her characters to analyse issues ranging from gender discrimination to religious co-existence, and does so in each case as an intelligent and natural extension of the story. Weaknesses are few and are mostly the natural issues that arise with a book being merely the opening section of a much larger tale. The book packs a lot into its 350 pages before ending fairly abruptly, leaving readers wanting more (although this is better than the alternative). There are a few passages which are a bit over-expositionary. I wasn't entirely sold on the romance that develops near the end of the novel with relatively little preamble. And that's about it really. Otherwise, this is a very fine novel. 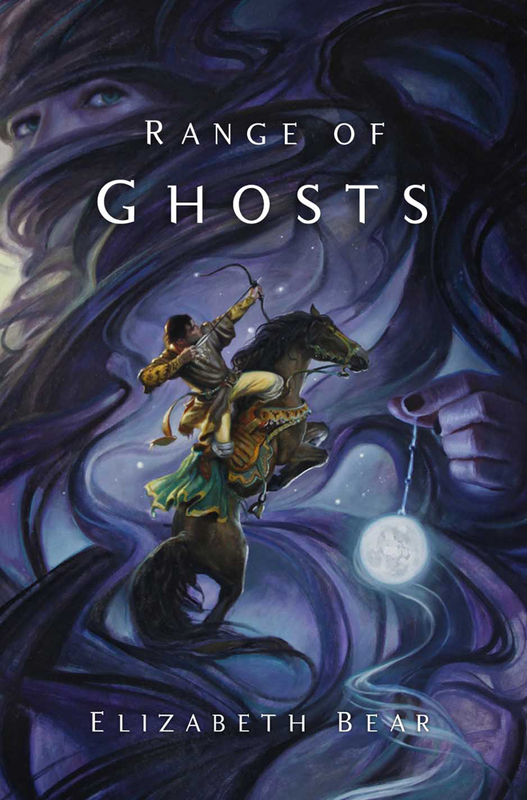 Range of Ghosts (****½) is an exceptional opening volume to a fantasy trilogy that blends different influences and the author's own impressive prose to great effect. It is available now in the UK and USA. The sequel, Shattered Pillars, is also available now. The already-delivered third book, Steles of the Sky, will follow in early 2014. This is one series that I keep lusting over whenever I see people reviewing it. I don't think I've read anything by that author in the past, but every time I see a review of books in this series, at least, it seems to be mostly positive and really makes me want to get my hands on at least the first book so I can give it a try. And it sounds like the kind of book that, in trying, I'll find myself sinking into very happily.